The 105th Nebraska Legislature convened Jan. 4 for its 90-day first session. Seventeen new members and eight re-elected senators were sworn into office, then senators elected the chairpersons of the Legislature’s standing committees. Lawmakers elected Norfolk Sen. Jim Scheer as speaker of the Legislature. Sen. Jim Scheer of Norfolk defeated Gothenburg Sen. Matt Williams to become speaker of the Legislature. Scheer replaces former speaker Sen. Galen Hadley of Kearney, who left the Legislature due to term limits. Scheer said he has served 30 years in public office as a local school board and state board of education member, mayor of Norfolk, and chairman of the Legislature’s Banking, Commerce and Insurance Committee. In these roles, he said, he has worked to treat all sides fairly–a practice he vowed to continue as speaker. “I promise to do my best to bring dignity and honor to this body,” he said. Term limits also opened leadership posts in five of the Legislature’s 14 standing committees; election defeats of sitting chairpersons in November opened two more. 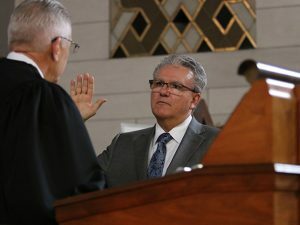 Sen. Dan Watermeier of Syracuse unseated Omaha Sen. Bob Krist to serve as chairperson of the executive board, which oversees all legislative services and employees. Watermeier said his experience as vice chairperson of the board has prepared him for the new role. Lawmakers chose Sen. Mike Groene of North Platte over Sen. Roy Baker of Lincoln to serve as chairperson of the Education Committee. Groene said that, as chairperson, he would focus on ensuring safe classrooms in Nebraska’s public schools, protecting the rights of parents and maintaining local control of curriculum. He also emphasized that the state’s school aid formula relies too heavily on property taxes and should be reassessed this session. Sen. Merv Riepe of Ralston defeated Sen. Sara Howard of Omaha to serve as chairperson of the Health and Human Services Committee. Riepe said that the Legislature must address the recent deaths of foster children who were under the care of the state’s child welfare system and lapses at the state Department of Health and Human Services that cost the state millions of dollars in payments to the federal government. As chair, Reipe said he would promote affordable, accessible care for all Nebraskans. “We must address the needs of the most vulnerable, give hope and opportunity, while being fiscally responsible,” he said. Sen. Dan Hughes of Venango was chosen over Sen. Rick Kolowski to chair the Natural Resources Committee. Hughes said living and farming in the Republican River basin, working with natural resources districts and learning about energy and environmental issues while a member of the Natural Resources Committee would make him an effective chairperson. Finally, Sen. Tyson Larson of O’Neill remains chairperson of the General Affairs Committee despite a bid by Sen. John McCollister of Omaha. Larson said that during his time as chair, the committee has helped create legislation to modernize the state’s liquor control laws and boost Nebraska’s economy. Two first-year senators also were elected in contested races to chair standing committees. Sen. Joni Albrecht of Thurston defeated incumbent Sen. Burke Harr of Omaha to serve as chairperson of the Business and Labor Committee. Albrecht said her experience as a member of the Papillion City Council, chair of the Sarpy County Board of Commissioners and co-owner of a family farm have prepared her to vet bills dealing with economic development. “I look forward to working with you to help grow not only our rural communities but our urban districts as well,” she said. Lawmakers chose Sen. Justin Wayne of Omaha over incumbent Bellevue Sen. Sue Crawford to chair the Urban Affairs Committee. Wayne said economic development tools like TIF need to be strengthened but used responsibly. As chair, he said he will work with all groups to promote economic development that will provide high-quality jobs to all Nebraskans, regardless of where they live. Elected in uncontested races were: Sen. Lydia Brasch of Bancroft to the Agriculture Committee; Sen. John Stinner of Gering to the Appropriations Committee; Omaha Sen. Brett Lindstrom to the Banking, Commerce and Insurance Committee; Crete Sen. Laura Ebke to the Judiciary Committee; Sen. Jim Smith of Papillion to the Revenue Committee; and Sen. Curt Friesen of Henderson to the Transportation and Telecommunications Committee. Sen. John Murante of Gretna was re-elected to chair the Government, Military and Veterans Affairs Committee in an uncontested race. Sen. Mark Kolterman of Seward also was re-elected to chair the Nebraska Retirement Systems Committee. 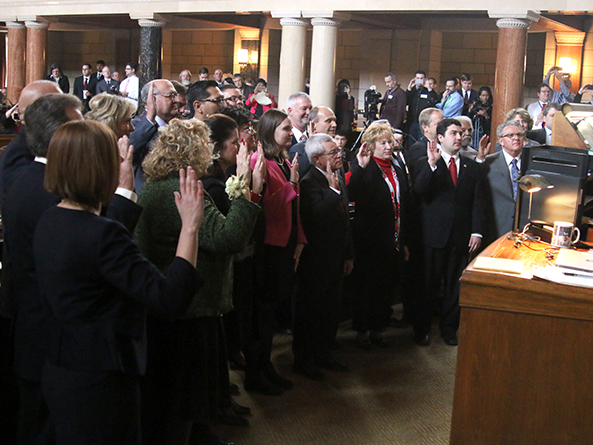 Session will reconvene Jan. 5 at 10 a.m. Senators may introduce bills for the first 10 legislative days, or through Jan. 18. Gov. Pete Ricketts will give his State of the State address Jan. 12 in the legislative chamber. Committee hearings are scheduled to begin Jan. 17 and continue through March. The session will last 90 legislative days and is tentatively scheduled to end June 2.